I'm not sure if you get these types of seminar spam in your mail box. I get one or two a week. Seminars that are held on a daily basis across the State of Ohio in the best Best Westerns they have to offer. Over the holidays these damn things filled half of my mail box. So I, being the eco-friendly employee that I am, shoved them all in Josh's mailbox on top of his gathering pile of spam. When Josh came back from the holidays, it took him a minute to realize that all that paper wasn't his. So he shoved them back in my box. We volleyed back and forth for a day or two, crumbling and folding and tearing the adverts. Some might observe, "Isn't the recycling bin right next to the mailboxes?" Yes it is and that's not the f*cking point. Upping the ante, I patiently awaited for new ammo to arrive. When it did, I took the mailings to the shredder, shredded them and stuffed the shreddings in his mailbox. I left some dangling out for effect. Josh caught on very quickly when he saw some of my accidental leavings by the shredder. Ever cut into confetti, those obnoxious mailings are easy to pick out from a distance. A few days later, Josh inquired if I wanted to borrow a book that he had been reading. I accepted the book from across the cubicle. He noted that there were several sections that he had thought I might find interesting. I did find them very interesting. I knew I had to take it up a notch. 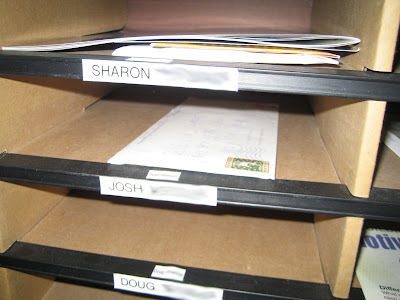 There was a new unwritten rule that the Spaminar mailings could not just be stuck in the other's mailbox. It had to either be freely taken or deposited in the mailbox by other means. So when more Spaminar mailings appeared in my box from the company, I took them and stuffed the mailings into an envelope. 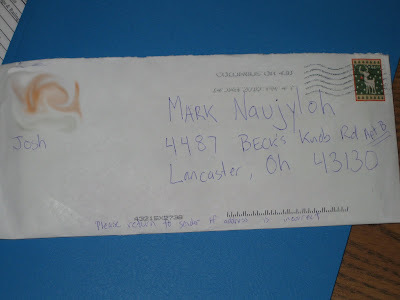 On the front, I put a fictitious address in Lancaster, OH. I put Josh's name as the sender with a little note requesting return service. I put a stamp on it and dropped it in the mailbox. Then our Prodigal Post came home. Here's' Josh after retrieving the mail. 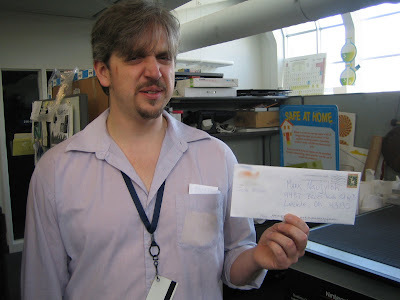 That photo was taken right before Josh realized that I had actually sent the letter out and had the post office boomerang it. 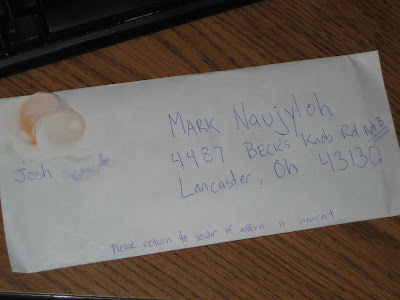 He thought I had just stuck it in an envelope and faked the front. Once he realize the length I went to, he was a bit more impressed. Here's the front. I was sad there were not any "RETURN TO SENDER" stamps on this. I can't wait to see what Josh comes up with next. I have one up my sleeve, but I need a refrigerator box. Let me know if you have one I can borrow. Excellent!!! I love a good work place spam mail battle. I suggest a process server. You can sit back and laugh when Josh "gets served" with a lawsuit of spam.